Goddess Saraswati is known as Benzaiten in Japan. She is the only female among the Seven Lucky Gods of Japan. 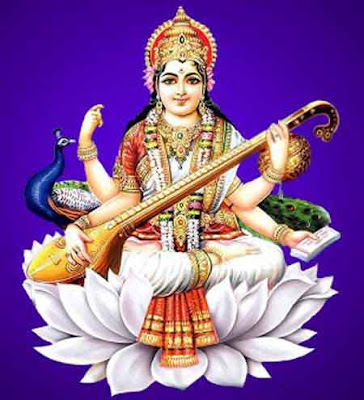 In Hinduism, Saraswati is the Goddess of learning and is depicted playing the Veena. Like in Hindu culture, Benzaiten is the goddess of music, dancing, acting, and good fortune. She is generally depicted carrying a Japanese mandolin called biwa. She is also portrayed as playing a lute. Goddess Saraswati reached Japan through Mantrayana sect of Buddhism. Like in Hinduism, in Japan she is worshipped by writers, composers, musicians and painters as patron goddess. She is also the goddess of the kitchen and in rural areas people make sketches of her in kitchens. Apart from this, she is also depicted with eight arms as the slayer of demons. She hold objects such as bow, arrow, trident, wheel, sword, key, and sacred jewel in her eight arms. It is said that Japanese Generals used to offer prayer to Goddess Saraswati before embarking on war. 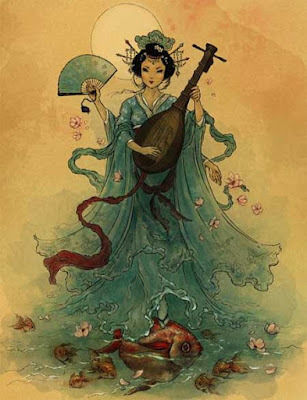 There are numerous stories associated with Benzaiten and she is said to have 15 sons. She is also known as Benten, Daibenzaiten, Myouonten and Bionten. There are several temples dedicated to her in Japan.